Le Rêve is appropriately named. French for " The Dream", Le Rêve truly envokes a dreamlike quality from start to finish, inviting guests to leave behind the walking world and fully engage in this "small collection of imperfect dreams." Wynn Las Vegas, where Le Rêve theater was custom-built for the show, is the culmination of a dream for casino mogul Steve Wynn. 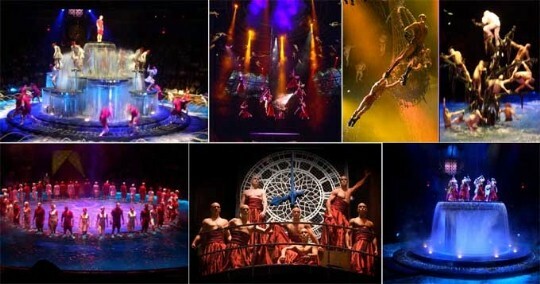 Le Rêve, as well, is the cuulmination of a dream for Franco Dragone of Cirque du Soleil fame. Once you step inside the Wynn Theater, you begin to truly experience the result of two visionaries combining their resources. Buy tickets to Le Rêve now ! Le Rêve - not unlike Dragone´s Cirque creations - does not force a narrative to be followed, instead it lets the amazing artistry and spectacular effects tell their own stories. Though there is a loosely structured underlying theme of the struggle between good and evil for the soul of man, it is transparent and peripheral to the spectacle of Le Rêve itself. 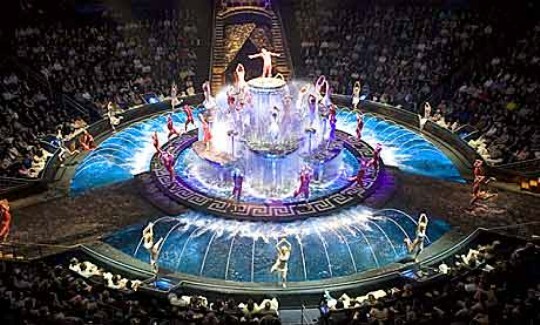 The show does not merely dazzle with its unique moving stage - which can transform from a completely submerged pool to a multi-plataform tower with the grace and skill of its performers - nor does it simply rely on the spectacle of characters diving into the water from amazing back flips or after an 80-foot drop from the dome´s crown. Le Rêve delivers very real human drama, such as when "everyman" character falls in love with the striking Sarah, only to lose her in the water. Was she real ?Was she a dream ? His loss and search is only temporary, but you cannot help but feel his pain. There are dozens of other moments like this, as well as subtle, endearing moments of humor, unsually provided by the clowning angels, who poke fun at the seriousness of the performers and the performance, while at the same time experiencing their own misadventures. From purifying rain showers and delicate, haunting snowfalls to battles in the sky and sultry underwater choreography, Le Rêve´s dreams will touch every corner of your soul. But be careful - you may never want to return to the walking world again. Click here to purchase tickets to Le Rêve now !